Can Disc Golf Save Your Relationship? So much of the time we talk about the benefits of disc golf as it pertains to our own individual games. We focus on our mental progress, our form, and the discs we keep in our bag. Yet oftentimes we forget to look at the impact that the sport can have on our families and particularly our significant others. Whether you’re a touring pro who needs the support of your spouse or you’re guilty of dragging your girlfriend out to the course more often than she likes, it might benefit all of us to examine the way that disc golf can affect our relationships and see how the sport can transform our lives. Think about the one or two activities that your significant other is in love with. Is it yoga? How about hunting? Or maybe, much to your chagrin, it’s scrapbooking? No matter what it is, it’s something they love to talk with you about and they try to get you involved every chance they can. We’d guess that in most cases, you probably don’t express the same amount of enthusiasm but you’re loving enough to halfway listen when they go on a rant about their passion. Sound familiar? For most couples who live together, this is the case. The same situation applies in reverse, as you’ve probably gone off about the foot fault that someone called you on last week or you’re glued to the television during each round of Worlds. Was your partner frustrated? Did he or she not want to hear about your stuff? Guess what - that’s probably how they experience your reactions too! 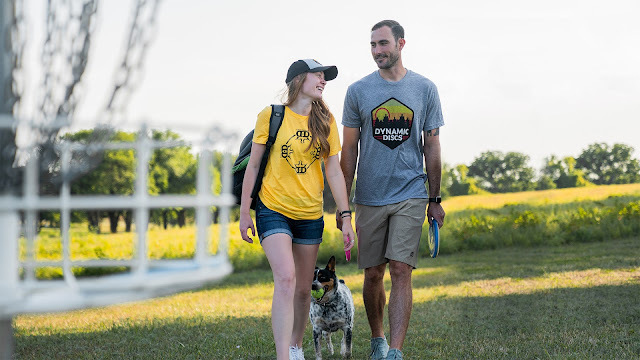 We’ve heard countless stories about couples hitting the course together and how disc golf truly helped them to grow closer together, so why can’t this be the same for you? Instead of bringing your partner to the course against their will or overwhelming them by explaining the flight path of every disc in your bag, imagine how you would want to be introduced to a new hobby. Does a three-hour tour of your local craft store sound fun? Exactly. Before you try to get your significant other to the putting basket or convince them to caddy for you during your next tournament, think about expressing some interest in their activities. Perhaps you can come to an arrangement where if you spend one hour per week doing hot yoga with them, they will spend one hour per week on the course. Every relationship is different, but there’s something to be said for sharing common hobbies and interests with your loved one. Instead of disc golf becoming the thorn in the side of your relationship, see if you can’t come to a compromise and share your extra time evenly between everyone’s passions. We’d love to hear from you - do you have an inspiring story where disc golf did truly save your relationship? How have you successfully gotten your uninterested partner onto the course? Share your stories with us in the comments below! In 2012 as a newlywed, I was spending $50 a week on greens fees playing ball golf. My wife was getting tired of the cost and the strain on our budget, so for my birthday, she gifted me with my first set of discs. She had heard about a new disc golf course in town, so she told me to try throwing frisbees instead since the game is free. 6 years later, I happily remind her who's at fault for my disc golf addiction! My girlfriend of 4 years doesn’t go playing with me that often, but she does come and watch while walking the dog, and I have bought a few discs specifically for her that she’ll throw on occasion. I feel like she’s almost at the point where she’ll start actually playing and I can’t wait! I started up ice skating last year because she loved it and I definitely started to have fun, so I would love for there to be yet another hobby for us to share!!!! Also go Team Trilogy!